Computer Cable Store™ RF modulator allows you to connect RCA audio/video components to a television with only an F-type connector. With our RF Modulator Now you can provide accommodations for DVDs, satellite receivers, game consoles, VCRs, VCDs, laser discs, camcorders, CDs, MDs, and any other av equipment on your older TV. 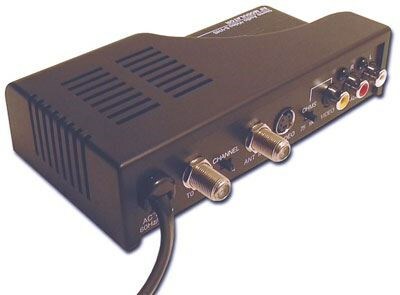 The Computer Cable Store™ RF modulator converts the video and/or audio output of a DVD player, camcorder, video game etc into a channel 3 or channel 4 signal that is compatible with any TV that is cable ready. Our RF Modulator is the perfect/best solution for connecting a/v devices to a legacy television allowing you to take full control. This device will convert your component RCA output device to an RF coaxial F-type connection typically found on TVs. However please be aware, it will not transmit a Digital RF signal, which is required to display high-definition video. It only outputs an analog RF signal. Excellent item, very useful for generating RF as needed to test and troubleshoot CATV and other RF systems. Portable, lightweight, and easy to use. Allows input from RCA or S-Video, output to coaxial cable. Plugged it in and worked perfectly in my Rv. Now grandkids can watch movies.